Imagine you attend a large church of 3,000 that's full every week. One Sunday, before the service even starts, the pastor tells everyone to leave. Why? Because there are 3,500 new people outside trying to get in! Does that sound like something you would read in the book of Acts? It's not. Then again, maybe it is. John Mitchell, Executive Director of Christ for all Nations, Canada, says he and his organization believes the book of Acts is still being written today. I met with John at their Cherryhill head office here in London, and he sees the "acts" of the Apostles-and the Holy Spirit-continuing on today among believers just as we read about in the New Testament book of Acts. John told me that the full church scenario I described happens regularly when Christ for all Nations (CfaN) holds a Gospel Campaign in African regions. The London office arranges literature support and distribution such as Bible study books and other discipleship materials for post-campaign follow up. CfaN's number one priority is simply "winning millions to Christ, one soul at a time." CfaN began 40 years ago with founder Reinhard Bonnke serving as a missionary in Botswana and South Africa in 1974. Although only 100 people came to the first meeting, Bonnke's fiery charismatic preaching, clear gospel message and reports of miraculous healings quickly brought exponential growth-in biblical proportions! For decades the Christ for all Nations has been drawing crowds of hundreds of thousands or even more than one million people-sometimes the largest single gathering ever assembled for that particular country. The CfaN London office is filled with many impressive panoramic murals showing huge numbers of people. It's difficult for us to visualize such gatherings, when a Superbowl or World Cup stadium of 80,000 seems like a lot. Some of the nightly crowds coming to a CfaN Gospel Campaign could fill 10 or 20 World Cup stadiums! More important that crowd size, however, is the spiritual impact. CfaN reports over 42 million documented salvations in the last 5 years. So, preparing and shipping Bible study and other spiritual training materials keeps the London CfaN Canada staff very busy indeed. Bible training materials are prepared and shipped by the container-load. Many African pastors see Bonnke as the Billy Graham of Africa. CfaN's largest focus and largest gatherings have been in Africa-even in predominantly Muslim areas. But, CfaN has also brought Gospel Campaigns to East Asia, India, and North America (eg. Miami, July 18-19, 2014). It should also be noted that 74 year-old Bonnke is presently active in ministry, but a younger man-Daniel Kolenda-has come alongside Bonnke as his co-evangelist. Today, Kolenda is the president and CEO of CfaN. John Mitchell told me Bonnke and Kolenda themselves do not claim to be "healing evangelists". However, as John explains, together with the clear message of the gospel, "we do see the Lord confirm his Word with accompanying signs." John explains that sickness is not the ultimate evil-sin is. Likewise, healing is not the ultimate good-salvation is. Since CfaN typically ministers to populations drastically short of adequate medical service, it is not surprising that people with significant medical needs would be drawn to CfaN events where reports of miracle healings abound. It would also not be surprising that God would choose to show His love by supernaturally healing people in places lacking in medical care, verifying the truth of His authority and merciful love. A man who had been deaf for almost two years had just arrived in town from another city by train and had unwittingly ventured into where our campaign is being held. He was a Muslim. He had no intention of coming to a Gospel meeting and he could not understand anything that was going on anyway, so he lied down and went to sleep. But when he woke up, to his utter amazement, he could hear! He came to the platform and stood before me trembling, overcome with emotion. He had a look of shock on his face. "My name is Mohammed," he said, and he proceeded to tell me his story. I asked him if he knew who had healed him and he said it is "The messenger of the Almighty God...Jesus." The whole thing was so raw and fresh. I could see he was struggling to come to terms with what he had just realized. "Jesus is, Jesus is...he is a God," he said, as though the thought had just occurred to him. He said, even the Koran says if you do not believe in Jesus Christ you are not a good Muslim. He seemed to be trying to justify this to himself. But I wanted to make it clear for the thousands watching this unfold, "Jesus is not just a messenger," I said, "He is the Son of the living God. He is the way, the truth and the life..."
By the end of our conversation, he seemed to be settled and completely sure, but he desperately wanted to get the message to his wife. So he announced the name of the city where he lives and said "If anybody knows me...tell my wife, Jesus is the Son of God!" I wish you could have seen the crowd. No football team has ever received such enthusiasm - they were jumping and dancing and shouting with joy unspeakable and full of glory. It is a moment I will never forget. John says CfaN considers unity among believers as key; if CfaN leaders sense discord among local churches in a prospective campaign location, they won't do a campaign there. "They're not ready", John says. Although CfaNs approach is Pentecostal/ charismatic, the ministry works in cooperation and partnership with a wide denominational range of churches including Anglican, Presbyterian, Baptist and Methodist. Music teams and counsellors are always recruited from local churches. At the campaigns, counsellors instruct the new Christians to meet them at their own church and the discipleship process goes on from there with Bible study classes etc.-using materials prepared and distributed with help from the London CfaN office. So, partnership with local churches is key for healthy discipleship with CfaN's ministry. 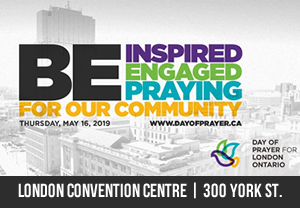 To find out more about CfaN, prayer and financial partnership, ministry resources and training events, check out their website: www.ca.cfan.org. Note one upcoming Ontario Christian training event: "fire2104-Live Before You Die", held October 24-25 in Mississauga. Daniel Kolenda will be speaking and London Pastor Tim Schwindt and team from Gateway Church will lead worship. www.fire2014.org.